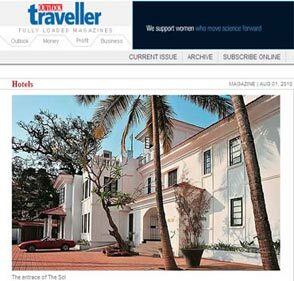 "If you're thinking of a Goa that's not just about the surf and the sand...The Sol is worth taking in. The beaches of Goa glitter and beckon hordes of tourist each year, and they are, quite needless to say, spectacular. But so overpowering are they in the public mind, it is only as an afterthought that it occurs that the state has other types of beauty to offer. Goa, we need to remind ourselves, is part of the glorious Western Ghats. Goa, we recollect slowly, has a fine riverine system and a lattice of lush mangroves. It is this other Goa that this little hotel in North Goa, promises to show you. In calling it little, I do not disparage The Sol; with 20 rooms gathered in a two-storeyed building built on half an acre, it is indeed small. The property opens directly to the road, and only a small strip of utilitarian yard surrounds it. 'Location, location, location,' they stress, and The Sol achieves it to an extent. Flanked by paddy fields and a long pebble's throw from the Sinquerim river, its surroundings are verdant. The building is white, elegant - and distinctive. Wrought iron gates are thrown open at the main entrance, old pieces of furniture are arranged artistically and everything somehow manages to look both period and contemporary. A little beyond the reception, in a style that's reminiscent of the traditional Goan central courtyard, an open area cleverly teams up with a small pool to create a nice outdoorsy nook.